She is confident, friendly and unassuming. She represents the new generation of women entrepreneurs from Pakistan, which is set to revolutionise the country's economy. Meet Jehan Ara, President, Pakistan Software Houses Association (PASHA), who envisions a boom in Pakistani and Indian infotech ties. Pakistan Software Houses Association is the Pakistani equivalent of the National Association of Software and Services Companies (Nasscom). She also heads Enabling Technologies, a multi-media and Web development company in Pakistan. Five Pakistani IT companies signed business deals with Indian companies at the just-concluded Nasscom 2005, a sign of bigger and better future prospects, believes Ara. Tell us about your association with PASHA. This is my second year as the president of PASHA. A lot of my time and passion goes into this role, I have a lot of belief in the IT sector and the talent that is available in Pakistan. I hope we can improve trade ties between the two nations, especially in the rapidly growing IT sector. How do you see the role of women in Pakistan's business environment? Today women are there in every field (in Pakistan). We have architects, pilots, engineers, professionals. . . in different sectors. Women are also doing well in the call centre sector as well. They don't mind working at night if transport is arranged. Today women run many businesses themselves. I run a multimedia company that is about 10 years old. We make multimedia CDs for clients like cater mostly to the domestic market. We also have clients like Alliance, ICI who have customers in the Untied States. The current crop of women is not going to be held back. I grew up in Hong Kong and moved back home ten years back and I have never found the country restrictive. I have been able to whatever I would have liked to do. How has Nasscom 2005 helped Pakistan's software companies? It has been a very exciting and interesting experience. A lot of networking has been possible. A number of Pakistani companies have signed MoUs (memoranda of understanding) with Indian companies. Nasscom has also agreed to bring a delegation of software companies to Pakistan later this year. PASHA and Nasscom offer a common platform through which companies can come together and promote business in both the nations. Could tell us about the business deals that the Pakistani companies have signed deals with Indian companies? An IT company, Emmaculate Solutions, has signed a deal with i-flex solutions to sell i-flex products in Pakistan. Another company, Delhi-based company Compare has signed a contract with Creative Chaos to set up 6 Web portals on Pakistan's tourism sector. The content will be developed by the Pakistani company while the technology will be facilitated by the Indian company. The first portal was launched on February 9. A company called Yevolve will be signing an MoU with an Indian transportation company to sell their e-ticketing solution. Another company Arwen Tech, in the BPO (business process outsourcing) sector, will be entering into an agreement with Hewitt India to expand services in Pakistan in the call centre business. SI3 is in talks with ICICI Infotech. In the financial and call centre business, there are lot of activities taking place as Pakistan is keen to expand its call centre business. Could you tell us about the software industry in Pakistan? Pakistan has about 450 software companies, about 60 are in the call centre segment and BPO business. Pakistan is keen on expanding business in this sector. The annual exports from Pakistan amount to about $130 million. We are growing at about 50 per cent a year. We see growth escalating to 100 per cent per year. We believe that there will be a lot of growth in the IT enables services than in software sector. The government is doing a lot of research to further developments in these sectors. How can Indian and Pakistan work together to promote trade? There is a lot of collaboration already as there is synergy between the two countries. There will be many areas where they will be competition. But we feel that India and Pakistan can work together as the IT market in India is mature. Many companies in Pakistan would like to market their products and services in India and vice versa. We have identified key areas within PASHA and Nasscom and we can work jointly to market our product to other countries like Saudi Arabia where Pakistan has a lot of easy access. The last Nasscom delegation to Pakistan in December 2004 had 20 companies and they had a good interaction with companies. They are coming back again this year, which is a positive indication that they are interested in the country. What are the challenges that you face in terms of developing trade between the two companies? We face two major problems. 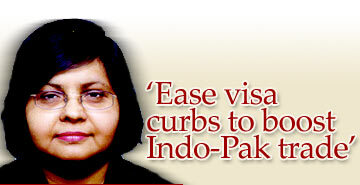 Indian and Pakistan are at the moment issuing only 'city' visit visas for just 15 days. The government should issue country visas. If I come to a Mumbai and meet a potential customer based in Delhi, I cannot go to Delhi without a separate visa. This hampers a lot of work. The total duration of the visa is only 15 days which is a very short time. We get visit visas to other foreign countries for a period of 6 months. The governments have to ease visa regulations to promote trade. What are the basic problems that have curbed the growth of IT in Pakistan? I think both our countries have not seen the IT revolution going to the rural areas, to the majority of our population. This is an area where both the countries can work together. We must ensure that the digital divide that exists between the rural and urban population does not go on for long. Majority of people in both the countries live in poverty. IT can go a long way to uplift the lives of a larger population. We held talks with the Infosys Foundation when Sudha Murthy (wife of Infosys Chairman N R Narayana Murthy) came to Pakistan. We are also talking with Nasscom and another group, which works on IT for the disabled and wireless connectivity. So we have been discussing this issue with different players to address the issues of a large number of people in both our countries. What are the advantages of investing in Pakistan? (Pakistan) Prime Minister Shaukat Aziz is spearheading the IT drive as this is an area where Pakistani companies can do well. We also see great potential in the BPO sector, as we have a good English-speaking force with a neutral accent. We feel that they we can go up the value chain through this business. The PM has asked major industrialists to invest in call centres in Pakistan. Our telecom sector is also a part of this scenario. There has been a $1 billion investment in telecom. Companies like Nortel have invested in Pakistan. Bandwidth cost is one of the lowest in the region in Pakistan. The environment is ready to take off for call centre business as well. Many industries based in Pakistan are investing in the technology sector as well. For instance, Arwen Tech is funded by a major textile group. People have started realising the potential of the IT companies. Is the political situation in Pakistan is the situation stable for companies to come and invest? The political situation is stable now in terms of business. We have had a GDP growth of 6 to 7 per cent. Businesses are doing very well. For about a year after 9/11, there was a lot of concern, but now things are looking up. Our stock market is at the highest it has ever been. The economy is growing well with growth in the telecom, IT and call centre business. I don't think there is any reason for concern. More companies are looking at investment opportunities in Pakistan. Hyundai has already set up its base in Pakistan. Which other sector in India is an attractive business proposition for Pakistan? We are looking at the animation sector as well. We have initiated talks with some companies in India. We would like our animation industry to work with Indian companies. There are many companies eager to work in Pakistan on projects that would cover the entire South East Asian region. This is just the beginning, we can go a long way to work on the synergies in the animation field. What is the future of IT sector in Pakistan? There is definitely a growth in the IT sector but we lack investments. A lot of expatriates have come back to Pakistan and invested money. This has fuelled the growth in many sectors, including IT. One year from now, we will be able to make steadier, faster and better developments. Does the government have special schemes to promote women's initiatives? The government does have special programs. But I am not very keen on marginalising women as a separate groups. I think they should be a part of the mainstream professional organisations. The government has set up entrepreneurships programmes, special incentives, even a women's bank for women who find it comfortable to deal with women. But big entrepreneurs want to be a part of mainstream development process. Is there a fear in the minds of the general public due to the hostile situation between the two countries? Is there a sense of fear especially when you travel to India? Not at all. In the last two years, several private, government and media delegations and cricketers from India have come to Pakistan. They have been warmly welcomed in our country. The tension exists in the government-to-government level policies and discussions. Among the people there is absolutely no fear and there has never been any tension. I have many friends in India. Most of the things that we talked about are very similar, our cultures and interest are very similar so I don't see any reason to be tense. People in India are so welcoming. Similarly when Indians come to Pakistan, we go out of our way to be hospitable.